There are a myriad of causes and types of thread damage that can jeopardize the integrity of a threaded connection. Some slight defects in non-crucial areas may be field repairable, but most damage will be grounds for rejection. Each manufacturer’s technical specs for a connection has it’s own tolerances and acceptance/rejection criteria that are adhered to by Cole Enterprises inspectors. Below is a sample of the most common types of damage. Contact us with any questions and for your inspection needs. A result of heavy impact with a blunt object during handling (metal not broken/cracked). Cuts are a result of a blow during handling, typically from a sharp instrument or piece of equipment, causing a large discontinuity in the metal of the threads. Pits are holes in the thread area caused by the threads being cut through air pockets or slag trapped in the surface of the metal. Pits may also be formed by corrosion of the thread surface. Corrosion occurs when threads have been rusted or eaten away at their surface. In certain cases, very light corrosion is still acceptable. We defer to each manufacturer’s specs. The corrosion/rust must not exceed the thread height or cause discontinuity of the threads in any case. 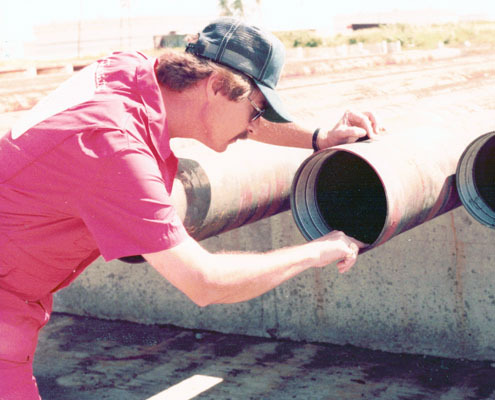 Galled threads are primarily found on used pipe. Galling can occur during the make-up/break-out process. They are characterized by a deformation of the original thread form typically caused by over-torque, repeated make-up, or improper thread form. These occur as a result of machinery, bolts, pipe wrenches, etc damaging the thread area during threading, handling, or hydro-static testing. These are areas of the threads which have been visibly ground down, causing imperfections and discontinuity of the thread surface. Grinds can also be visible in the pipe body. Torn threads are a result of the cutting inserts or chaser tearing the surface of one or more threads during the threading process. Skip or sawtooth chatter is an interruption of the continuity of the thread surface resulting from a dull cutting insert or improper setup of the cutting head during the threading process. The cutting insert jumps or vibrates causing irregularities in the crest, root or flanks, or a combination of them. Shoulders on the connections themselves are the presence of positive or negative metal on the surface of the crest, root, or flanks, resulting in a “stair-step” or notched effect. In many instances, a metal file may be used to field repair the thread if within manufacturer/API specifications. This can occur in the pin or coupling end and may prevent proper make-up to power-tight and may promote cross-threading. Also called Black-Crested Threads. They can be caused by improper setup prior to threading or out of round pipe. Black crested threads appear as the original pipe surface remaining on the crest of the threads. Check manufacturer specs. Buttress threads are permitted no more that 2 threads less than 25% of the circumferential distance around the pipe in the perfect thread area. A lap is a discontinuity in the pipe metal which extends into the thread area. It appears as a hairline crack and must not extend into the perfect threads, past the root cone, or exceed 12.5% of the nominal wall thickness measured from the original pipe surface in the imperfect thread area. A seam is a crevice in rolled metal which has been more or less closed by rolling or other work but has not been fused into sound metal. The seam must not extend into the perfect threads, past the root cone, or exceed 12.5% of the nominal wall thickness.